What are Hendrick’s Gin Up to Now? Wow, this looks incredible. Hendrick’s Gin, our favourite eccentrics, are teaming up with The Waldorf Project to present a preliminary “Experimental Research Laboratory”, exploring ambitious concepts to be staged in full in early 2016 as The Waldorf Project: Chapter Three / FUTURO. It will run from 14 – 16 May 2015 in a tunnel in London’s historic Kings Cross as part of the area’s Festival of Perception, and will be an opportunity to explore a full range of ambitious concepts and techniques in a more intimate, exclusive setting – while still creating a stand-alone experience. Over six months, King’s Cross will stage a diverse range of events curated by artists, writers and performers in conjunction with The Guardian, School of Life, Lost Lectures and King’s Cross: events which will make you question your senses and ask you to contemplate what’s real and what’s imagined; events which will challenge you to ‘see’ the world through new eyes. Eight of the most pioneering practitioners in the worlds of visual art, gastronomy, design, theatre, choreography, electronic music and mixology will come together to and develop the concept of an art performance through a rare synergy that delivers a singular collected sensory emotional reaction for participants. This synergy, combined with the imagination and bewildering skill of the creative team are interwoven and directed by artist Sean Rogg. Inspired by “Futuro”, the pre-fabricated flying saucer-shaped house designed by Matt Suuronenn in the late 1960s, the minimal yet radical performances interpret and distil golden notions from the era, challenging guests and offering a new perspective, by way of a complete emotional excursion into the future. Chapter Three/FUTURO centres upon those more fantasised visions of a utopian society – the dreams of a world which exists solely to facilitate pleasure, comfort and delight. Put out of your mind edible insects, overcrowding and global warming, FUTURO presents a world enchanted by the possibilities of its future, not subdued by the limitations of it. 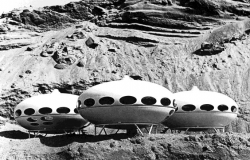 The “Futuro” house, created at the height of the “Space Race”, manifests the idealism, progression and constant striving towards supremacy dominant at the time. The design industry exploded, ergonomics being the key towards a more productive, efficient and gratifying world. Chapter Three/FUTURO mirrors this, and as the venture embarks on its third installation it will further push the boundaries of art consumption and emotional sentience, this time set playfully in the future. Moving beyond Chapter Two/COLOUR, in which colour was imposed through emotion, sound, taste and environment, Chapter Three/FUTURO will work with an even more challenging palette: black and white; or, more accurately, “black and light”. Through close integration of product design, the Waldorf Project is now also able to create a seamless connection and harmonised geometry of object, sound and taste. Crucially, the Waldorf Project takes a final leap, in presenting each course (comprising) through liquid form alone. In a menu comprising proteins, fibres, carbohydrates, hydration and alcohol, the science and magic of micro-distillery will also drive the boundaries of how alcohol spirit – throughout the E.R.L. it will be Hendrick’s Gin – can be administered through the senses. The Experimental Research Laboratory phase of Chapter Three/FUTURO will take a further stride into artist Sean Rogg’s exploration of consumption as more than a mere physical function, but as medium to absorb art through all the senses. As with Waldorf Project’s Chapter Two/COLOUR, the concepts that will be explored in Chapter Three/FUTURO are so ambitious that a preliminary Experimental Research Laboratory is being staged. The full Chapter Three performance will be taking place in early 2016. Tickets (£78) to the performances are available through www.waldorfproject.com. With just six performances in three days, demand is expected to be extremely high following the triumphal sell-out of Chapter Two/COLOUR, held earlier this year.